Here is a captivating moonrise in three parts, captured by photographer Dan Marker-Moore. Up first: a 10-second timelapse of a full moon rising above the smoggy L.A. skyline. The clip captures the moon's half-hour transformation from a ruddy sphere low on the city's horizon, into a gleaming white orb, hung high in the night sky. Just gorgeous. Easily our favorite moonrise since this one, which was shot back in January over Wellington, New Zealand. (Believe it or not, the linked New Zealand moonrise footage is presented in real time – i.e. it's not a timelapse. Definitely worth checking out.) Marker-Moore gets extra points for creativity. 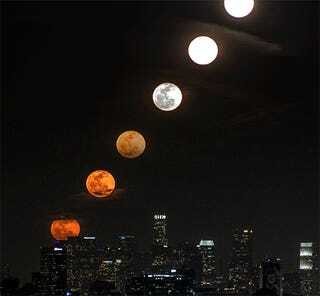 If all moonrises could now be presented in GIF + time slice form, that would be excellent. See more of Marker-Moore’s work on his website and Tumblr.